The way to put a damper on a choco-holiday. I am not a fan of the way Americans tend to celebrate minor holidays, as though they were cosponsored by The Association of Sugar Beet Growers and whoever manufactures insulin for the mass market. As Husbot–who never uses the last paper towel on the roll because of the glue–can attest, waste makes me unreasonable. And so when I returned to the garden yesterday, and saw the row of carrots–which get less sweet with each passing day–I can sympathize–stretching into the distance, I decided to make their little carrot lives count. I dug and yanked and dug and yanked, thinking, I will make carrot soup, and carrot cake, and carrot pancakes. I will give these to neighbors, and friends, and teachers, and I will bring them to the Toddler Valentines Party. Every toddler should know what a carrot is supposed to taste like. My own have been eating them like candy since our Adventures with the Earth. With such a high natural sugar content, the little beta-carotene bombs practically are candy. Practically being the key word. They keep best stored in water in the fridge, and so I didn’t get them ready ’til just before take-off. Of course, I could have cut out thirty paper hearts and written thirty cheerful messages and taped them to thirty paper strips, the night before. I did not. The older I get, the less sympathy I have with my last minute rushes to reach ambitious goals that I knew about yesterday. I finished attaching the hearts, via paper bands and Scotch tape, to the carrots, in the driver’s seat of the Midgetmobile, because I realized that if I wanted to finish the project before the party ended, Bot immobilization was required, and since I haven’t gotten around to ordering those cages that hang from the ceiling, I had to settle for five-point harnesses in the back seat. The carrot cards were a hit–at least with the mothers. One child, who has a garden of his own, ate it before he opened his Skittles. 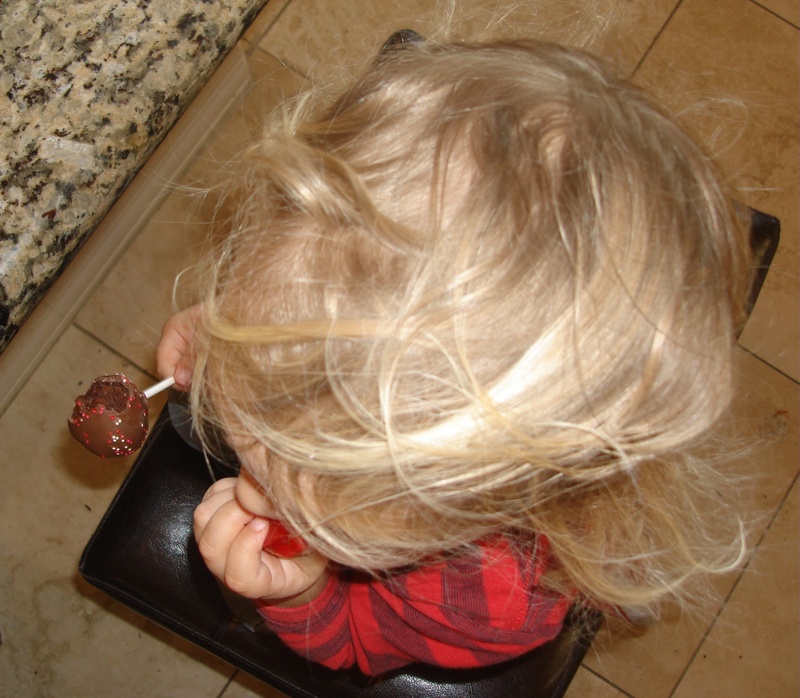 As for my own children, Gbot stationed himself in front of the chocolate cake pops and managed to eat half of four of them. Mbot finished a cake pop, stole his brother’s Skittles, sneaked the Tootsie pop I told him he could have after school, moved on to the Jello hearts, and begged for a cupcake, which we took home with us. And which, upon returning home, Gbot attempted to reach by balancing the bathroom stool on the dog bed. I understand. If I found carrots–even the greatest carrots ever–in my Christmas stocking, I’d write hate letters to Santa. And the Bots cannot just reach into the freezer for a handful of chocolate chips whenever they want. But the obligatory sugar load still makes me cringe. We’ve got a month to detox before we do it all over again, except then the sugar will be green instead of red. Carrots will be out of season. But the broccoli might be ready. Doublefisting the cake pops and the jello hearts. 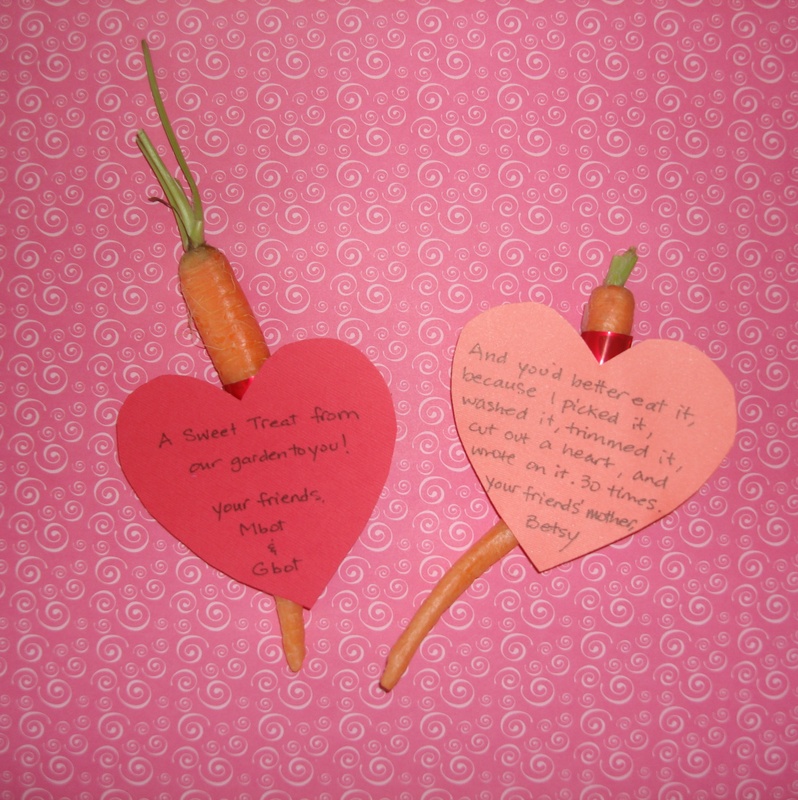 This entry was posted in food, humor, toddlers, Uncategorized and tagged food, gardening, humor, life, Parenting, Valentines Day by Betsy Andrews Etchart. Bookmark the permalink. this is adorable!~ I want everyone to see it! Thank you! I appreciate the reblog! But sadly, I can’t imagine that this kind of Valentines fare will really catch on! This reminds me of the ghost finger-puppets I made for Halloween treats! Well… the mothers loved ’em. They sound GREAT. Please remind me closer to Halloween that they are not.